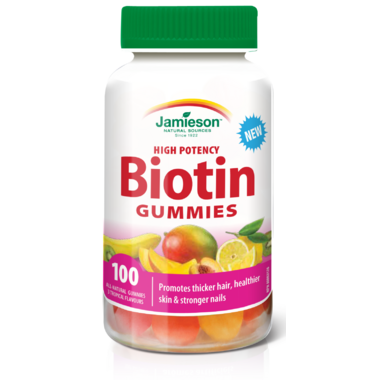 Nurture your natural beauty from the inside out with Jamieson Biotin Gummies! Enjoy these delicious gummies in 3 natural flavours: sweet lemon, mango peach & tropical punch, while they help promote thicker hair, stronger nails and healthier skin. Directions: Chew 2 gummies daily. Consult a health care practitioner for use beyond 1 month. Store between 15°C and 25°C, away from children. Ingredients: Gelatin, glucose syrup, sucrose, citric acid, lactic acid, natural flavours (mango peach, lemon, fruit punch), natural colours (annatto extract, purple carrot juice, turmeric), fractionated coconut oil, Brazilian palm tree wax, beeswax. I have been taking these for 3 weeks and noticed that my hair is more manageable and nails have to be cut/filed more often. The option of gummies is new to me, so I welcomed not having to swallow more pills. Recommend yes ! I take these with my breakfast. It's nice to have a gummie instead of yet another pill to swallow. The down side is the glucose in it. But with all the supplements I take, I am willing to accept taking a gummie. I remember to take them too. I think they are helping, starting to slowly notice a difference with my nails. They are tasty and do not taste medicated at all. Yummie! I actually remember to take these because they taste so good! And Jamieson is a company I trust !